You can hire an official Machu Picchu tour guide on our website for any day of the year. A guided tour lasts about 2 ½ hours. 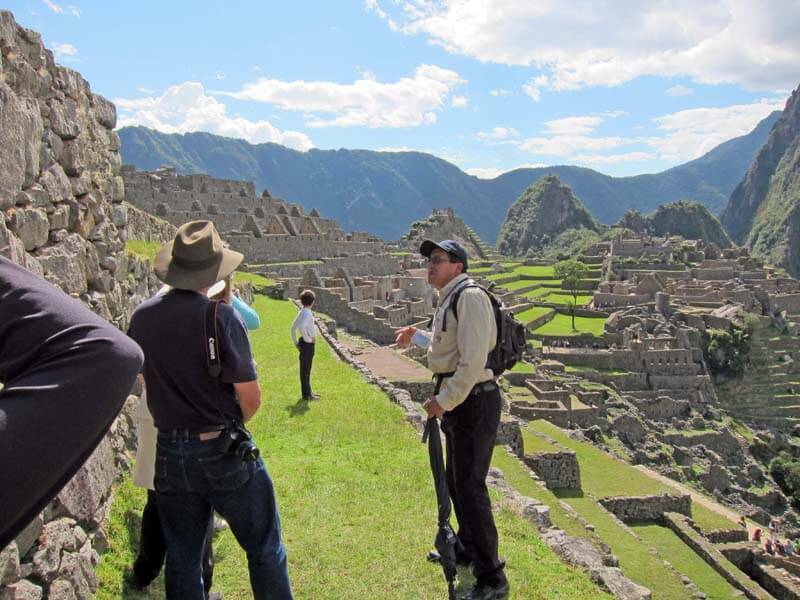 Only professionally qualified and authorized guides can guide at Machu Picchu. Authorized guides must have completed a university degree in tourism and must have a valid certificate of professional qualification issued by the National College of Tourism. A photo identification card issued by the National College of Tourism should always be worn by the guide. Furthermore, all guides operating at Machu Picchu must additionally be certified in first aid. When you hire one of our Machu Picchu tour guides, your guide will meet you at the main entrance gate of Machu Picchu and can be identified by a photo identification card hanging around his/her neck. Additionally, we include a pre-briefing and introduction prior to the scheduled time of your tour. The pre-briefing and introduction is at your hotel in Aguas Calientes the night before at 7pm or if you are arriving the same day, our staff will try to meet you at the train station exit with a sign with your name. Please let us know your hotel or train arrival info when you make your reservation. Even if you do not hire one of our Machu Picchu tour guides, prices are pretty much standard amongst the guides, so don’t try to barter one off against another. The price depends on how many people are in the group, but as a general rule of thumb for a 2 ½ hour guided tour, you will pay about $25 dollars per person. Tour guides are independent contractors, so they have to pay for their own transportation to Machu Picchu and their own tickets to enter Machu Picchu so take this into consideration when hiring a guide and tipping them. When you hire one of our Machu Picchu tour guides, you have the option to choose what language you would like the tour guide to speak. We have tour guides that are fluent in English, Spanish, Portuguese, French and Italian. At the end of a guided tour of Machu Picchu it is customary to tip the guide. Although you might feel obliged to tip, never forget that a tip is not mandatory and is only a reflection of how much you enjoyed the service provided. US$ 3-5 per person is acceptable.